But on the internet, you are your content. Those static paragraphs, pictures and buttons speak for you now. On your website, you need to connect with people you can’t see and answer questions you can’t hear, fighting for their attention one line at a time. How do you impress without being there in person? How do you keep your visitors engaged? And how do you make them trust you enough to buy? Here are 11 proven tips that will help you create web content that gains trust and converts visitors. I’m sure you’ve heard this often enough: Your website should load fast enough for your visitors. For e-commerce websites, Google recommends a threshold of 2 seconds. In any case, monitor your page load time and bounce rate to see if any of your pages load too slow. Make sure the page content is relevant and keeps the promise of its headline. Nothing betrays the trust of your visitors faster than a click-bate headline and irrelevant content. 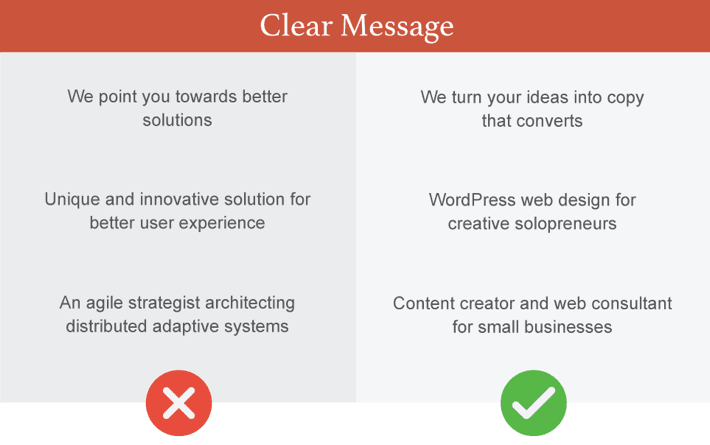 Make sure your homepage clearly states what you do and how it benefits your visitors (more on this in a second). Make answers to frequently asked questions (for example, contact information, opening hours, shipping costs, etc.) easily accessible. 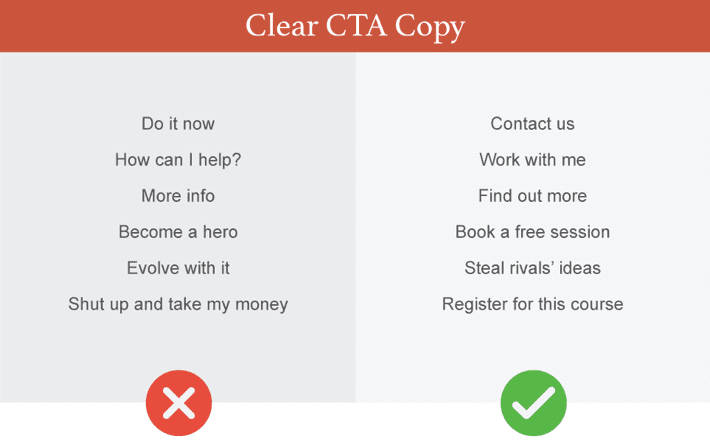 Make as many of your CTAs as possible work out of context. If your CTA says “Info” or “More”, you are creating an unnecessary friction and forcing your visitors to read more text to understand what that button does. The slogans of world famous companies are often praised as examples of copy to look up to. Wouldn’t it be great if your business had a catchy tagline? Your website visitors won’t act on things they don’t understand. So, it’s important that your copy is clear on every page, but especially on your homepage. Fail to deliver the answers instantly, and you lose them. Look at your website tagline. Would you use the exact same words to describe what you do to a friend in a conversation? If not, you may need to change it. 1). Define your target audience. 2). Decide what the biggest benefit of your product or services is. Autotranslate your page into another language you speak. Your brain won’t be able to trick you by automatically filling in the blanks, so you’ll easily spot the missing information. Besides, as Google doesn’t do well with metaphors, you’ll know if you are being too clever if the translation won’t make any sense. 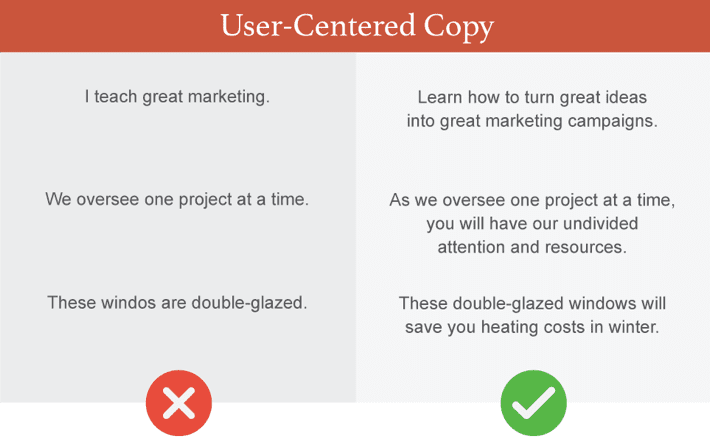 But as most of your visitors care only about what you can do for them, you need to center your copy around their needs. Make sure your tagline and subtagline focus on how you can solve their problems. Describe the features of your product using benefits. Look at your About page as a landing page with a clear action you’d like your visitors to take – contact you, check out your services, etc. Don’t over blow the part where you tell them about yourself. Regardless of the page, focus on building trust and describe the ways you can help your potential customers solve their problems. 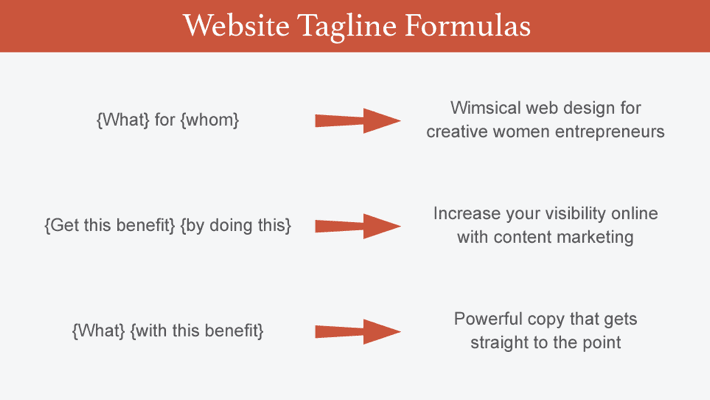 Your website visitors will skim your page. Once they find something they are interested in, they’ll start reading. To help them find what they are looking for faster and to keep their attention when they dive into it, you need to make your page easy to scan and text, easy to process. Use a minimum of 16px as body font size, with possible minor adjustments based on your font’s properties. If your target audience is older, consider using a larger font size. Don’t make your paragraphs longer than 4 lines, but don’t overdo it with one-sentence paragraphs either. If you have 5 one-sentence paragraphs in a row, the layout becomes monotonous. 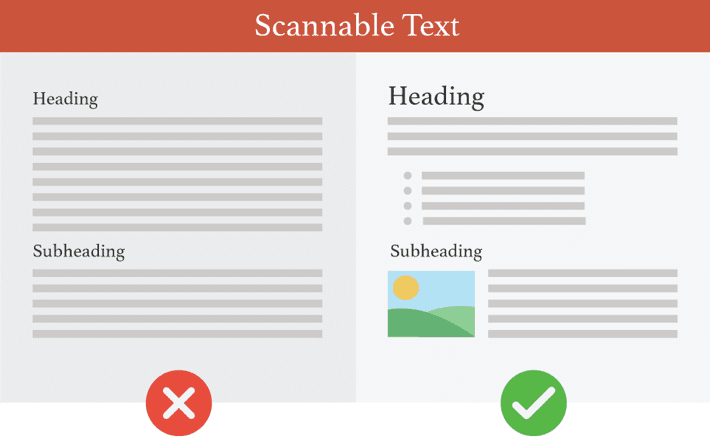 Use headings and subheadings to make your page easy to scan while paying attention to their visual hierarchy. If both section and subsection headings have the same style, your visitors will need to spend extra effort to understand the structure of the text. Use bullet points, italic or bold highlights or block quotes to break the visual monotony and preserve the attention of your readers. Don’t overdo it, though. Too much of “the other thing” is again boring. It doesn’t mean that your website visitors will never have time to read anything on your website. They will make time for your content, but only if you manage to convince them fast enough that your content is worth their time. Navigation has a premium location on your website. So, it’s tempting to put as many links as possible there. Yet, the more options your navigation offers, the less is the probability that your visitors will click anywhere. Don’t use more than 7 items in your navigation (the maximum number of items we can hold in our short-term memory). Make sure the labels are short and descriptive. People won’t click if they aren’t sure what to expect. Make the most important links as the first and the last links in your navigation menu, as those will be the ones your visitors will remember more easily. You can also highlight one label that would be your preferred choice for your visitors to click putting it last. Avoid drop-down menus. Studies show that website visitors find them irritating and are likely to skip the top-level pages. If you or your company works with clients face-to-face, showing your face on your website is a must. Seeing a likable and trustworthy picture or video of you gives your visitors a better idea of who you are as a person and whether they can trust you. But don’t rely on your prospects to visit your About page to “meet” you. They might not make it there. Start building a relationship with them where they are most often – on your homepage. Use photographs of real people from your team wherever possible, as your visitors will react differently to stock photos. Although your visitors will initially judge your website based on its design, whether they will stick around and buy depends on how well your design supports your message and how easy it is to use. Unfortunately, too often design gets in the way of bringing out the important information. The most common example used on even simple websites are the elements that move by themselves. Whether it’s a blog post, a testimonial or a client logo carousel, studies show that the elements that move uncontrollably frustrate your visitors and cost you valuable clicks. What to add a hip design feature? Ask yourself why. If your only argument is “because it’s pretty”, it shouldn’t be on your website. Don’t put your goals before the goals of your visitors. Pop-ups, sliders and welcome mats. Users loathe them, yet, website owners proceed using them. No wonder. Numerous case studies show that pop-ups help you grow your email list. If you are a small or medium business owner, on average, you need 1319 people to see your opt-in interstitial to get 1 email subscriber who clicks on a link in your newsletter. 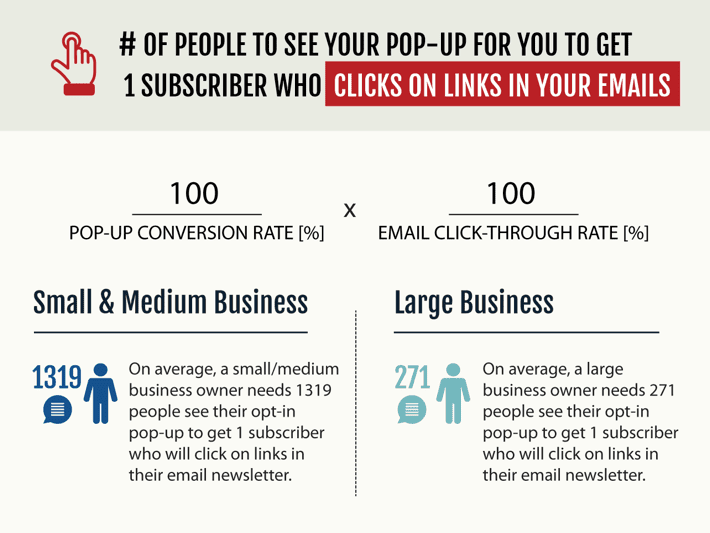 How many clients does your pop-up cost you? If you can live with this number, great. A sticky footer or header with a sign-up form. Lead magnets placed within the relevant content. A dedicated page for a lead magnet that ranks well in search. The more text columns, images and CTA buttons are competing for your visitors’ attention, the less attention will each of them receive. 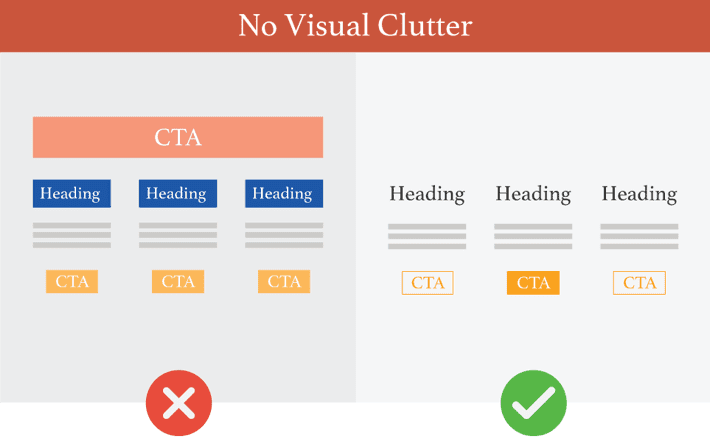 Also, if your page is visually cluttered, your visitors won’t be able to recognize what’s important and may not take that action you want them to take. Make what’s important visually prominent. Maintain the visual hierarchy to communicate the relative importance of the elements. Your prospects have no reason to take your word for it. That’s why it’s crucial to back up your claims with credible customer testimonials. Yet, not all customer testimonials are created equal. Include a head shot, a real name and a company name. Make sure the testimonial addresses a problem or a fear and shows how it was eliminated, or uses numbers to show improvement. 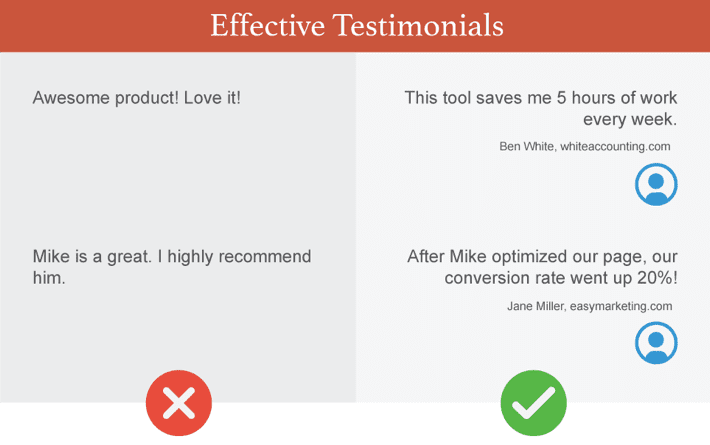 Use testimonials in context every time you need to back up an important claim, for example, next to your call to action. Ideally, use video testimonials. They are the most powerful, because your prospects can also perceive the non-verbal information, in particular, positive emotions about your product. Check your Google Analytics and consider removing Testimonials page from your navigation. Testimonials without the context lose their power, and you may find a better use for that valuable spot in your navigation. Winning trust with web content may seem different from how you would do it in person. But it’s really all about the same things. …and how it makes your visitors feel (user experience). Sure, every website is unique, and somewhere in the online universe there is a horribly cluttered website with five pop-ups and three exclamation marks in a tagline that brings in good money. …will get you a long way towards winning their trust and, ultimately, converting potential clients into paying customers. 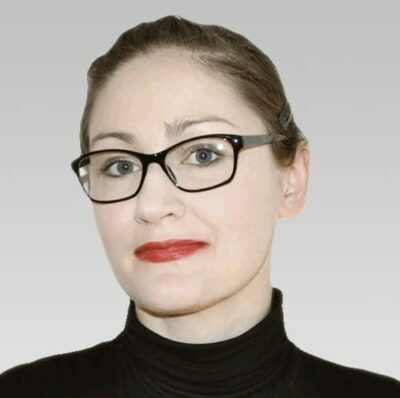 Gill Andrews is a content creator and web consultant who turns underperforming websites into slick lead generating machines. To tune up your small business website, get her interactive website checklist. Follow Gill on Twitter or connect wth her on LinkedIn. This is honestly one of the best posts I’ve read in a long, long time. Actionable and eye-opening throughout. I totally agree with your point about pop-ups, by the way. Sure, there might be a few data points out supporting ’em if you have a massive audience already, but it always shocks me when new freelancers are trying to push a bunch of pop-ups without even having an active blog. Also, the you/I ratio is something that took me a while to figure out (still working on it, honestly). Again, awesome stuff. Bookmarking and sharing for reference. Thank you for your kind words. I’m also happy to hear you found this advice useful. Those case studies about how awesome they are always bothered me. It seemed counterintuitive and against any logic. But arguing that it’s bad UX is useless, as those case studies have not opinions but numbers on their side. Based on what I see on other websites, I would say it’s one of the most common mistakes. Which is to some degree understandable: “People came to my website, so I need tell them about me.” Probably that’s why it takes a bit longer to figure out that it won’t be as effective as putting the emphasis on how you can solve customer’s problems.